For the typical street cruiser, it's tough to beat the simplicity and reliability of a mechanical fuel pump. 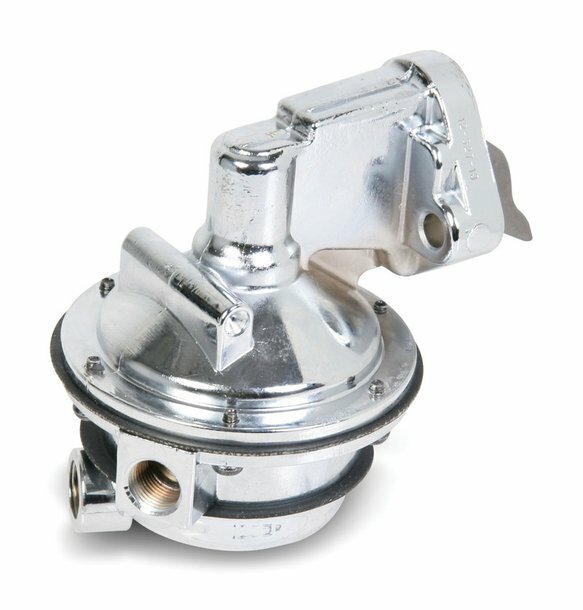 Available for small- and big-block Chevy, Chrysler and Ford engines, Quick Fuel Technology's mechanical pumps flow 110 gallons per hour and utilize lightweight aluminum housings. They feature integrated shutoff valves that are preset at 6.5- to 8 psi, eliminating the need for a separate pressure regulator. For added installation flexibility, the pump casting can be rotated to accommodate various plumbing configurations. Designed for carbureted small block Chevy V8 engines. Flows 110 GPH (Free flow). All Aluminum housing for weight savings. Shutoff pressure pre-set from 6.5-8 PSI. Inlet & Outlet tapped for 3/8" NPT. Heavy duty construction for continuous high RPM operation. Fuel body castings can be rotated to accommodate various plumbing situations. Fuel pressure regulator is not required.